All reasonable questions, I guess, for students who have grown up in a world where they almost never encounter poetry, other than in song lyrics or spoken-word events. Poetry, they tell me, is intimidating; it doesn’t make sense; it’s too complicated; it’s weird. Full disclosure: I spent most of high school and all of college writing poetry. Whenever I’d get too philosophical during those late-conversations about Life that seem only to happen between the ages of 18-22 and only between the hours of 12-4AM, my friends would say “oh go write a poem,” as a way to get me to be quiet. All of which is to say is that although I knew my students wouldn’t be excited about spending all this time reading poetry, I was looking forward to spending time with words, nothing but words. Someone said once that poetry is language calling attention to itself, and while I think poetry can be much more than that, that idea isn’t a bad place to start. Poetry gives us a chance to think about how words feel in our mouths and sound out loud; poetry’s language works by compressing, distilling, wringing an experience or idea to a kind of essence that works on us in ways that we might not ever really understand. We roamed through Seamus Heaney’s “Digging,” in which a gun transforms to a spade transforms to a pen in the hand of the poet; we looked at John Donne’s “Batter my heart three person’d god,” in which faith becomes a kind of ravishment, a physical experience; we talked about the bleak beauty in some of Anna Akhmatova’s lines; and marveled at the incandescent anger of Sylvia Plath’s “Daddy.” The students put aside “it’s weird,” or perhaps, actually, they began to embrace the weird; they let themselves roam around inside the poems and not insist on absolute meanings. And I got, perhaps, a little carried away by the whole thing and put a sign on my office door that said “Today’s Poem,” and then every day, I would post a new poem — a famous poem, an obscure poem, prose poem, haiku, nabati lyric — all kinds of poems. And yes, that’s what it looks like on the page, and yes, that’s the entire poem. And yes, it’s a little weird. But you know? Think about being in a crowded subway station, on a rainy day. Think about the blur of faces. Now think about the blur of wet, say, cherry blossoms on a dark branch. I guess the student who scrawled this comment at the bottom of the Pound poem wanted to live in a world governed entirely by reason. That strikes me as incredibly limited, and not a little bit sad. Doesn’t make sense. Quit wasting paper. in which teaching becomes a metaphor. or something. 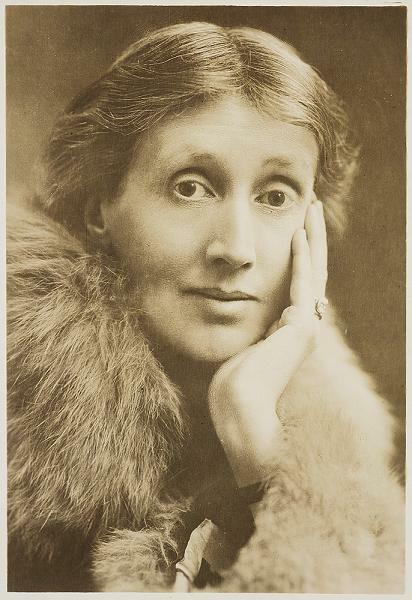 Next week I am teaching Virginia Woolf’s brilliant and amazing essay A Room of One’s Own. Of course, what I meant (I think) was that I need to figure out how to help my students tackle this long essay. It is a room of independence, I guess you could say; and Woolf was smart enough to understand that without freedom from economic worry, it’s very difficult to feel the freedom to create. In this house that we’re renting, there’s a little room tucked in between the entrance to the garage and the laundry room. On the floor plan of the house, this room is designated “maid’s room.” Lots and lots of people have live-in help in Abu Dhabi, in part because if you hire someone full time, you have to sponsor the person’s visa–and in order to get a visa, you have to have a place to live. We don’t have any live-in help (I don’t want any witnesses), so I have adopted that room as my office. My god. It’s another room-based metaphor: my “room of my own” is…the maid’s room. And that’s the challenge, isn’t it? In between driving and errands and laundry and housekeeping, in between earning money and making lists and going to meetings, somewhere in all that, a person should find the courage to write exactly what she thinks. Malls as far as the eye can see…but what about a science museum? Today in The National, I’m writing about the speed with which Abu Dhabi is growing: everywhere you look, there are construction sites, cranes, earthmovers. But the construction seems dedicated to malls and apartment buildings…I’m wondering whether someone couldn’t design a children’s science museum? When it’s 44C in the shade, wouldn’t it be great to take the kids “science-ing” instead of shopping? Click here to read the article–and let the newspaper hear your comments!